I've strayed away from my beloved Argyll this time to bring an entirely new area of Scotland to you and have travelled south - to the southernmost part of the Scottish mainland in fact - all the way to the Mull of Galloway on the Galloway Peninsula. Although its only about 120 miles from Strachur, the coast road - A77 - is slow because it is very busy, until you pass Stranraer when the road down the eastern side of the peninsula becomes the A716 and then it remains slow because it snakes through serious farming country. Just south west of Stranraer on the A77 lies the very pretty Portpatrick a busy and bustling harbour which has been in existence since at least the 1500's. In the 1800's Portpatrick was the original ferry port for travel to Northern Ireland with a railway station coming right down to the harbour but as it opens to the Irish sea and is storm blasted throughout the winter, constant repairs became expensive and Stranraer on Loch Ryan became the favoured choice of harbour although this added to sailing time. In Portpatrick you can also find the starter marker for the Southern Upland Way - a long distance footpath. Unlike the Mull of Kintyre, at the Mull of Galloway, extensive funding has been spent on creating walkways, parking lots, a wildlife reserve and visitor centre - from lodgings used to house the workmen who built the lighthouse in the early 1800s - and a fabulous new, environmentally friendly coffee house (the roof is turfed so that it blends into the surroundings). The Visitor Centre is run by the Royal Society for the Protection of Birds (RSPB) and offers huge amounts of information on the birds who live in and around this rocky outcrop. They have live webcams on specific bird activity and a short video film (8 mins) on the history of the birds who cling to the rock face in their thousands. 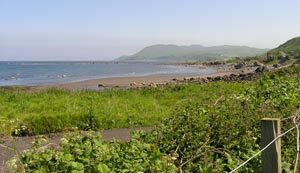 I've been as far down this coastline as Girvan in my youth - anyone who's been brought up in Glasgow will have visited the Ayrshire coast and Girvan at some time during their childhood - but never into Galloway - and what a treat it was. The landscape is such a change from Argyll. Here the hills are short and rolling, green lush fields stretch as far as the eye can see and in most instances flow down to golden sandy beaches which stretch for miles and life is calm and meandering - just like the roads - meandering that is, not so calm. The roads criss cross from east to west and north to south (apart from the A77, single track mostly) and cut through the extensive farming lands but you rarely loose sight of the sea. With it's very mild climate they have many gardens you can visit with some astonishing plants and this photo (left) was taken, not in some safari park in Africa but in Logan Botanic Gardens deemed 'Scotland's Most Exotic Garden'. 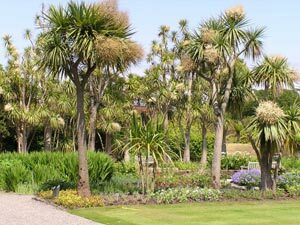 It is one of four Botanic Gardens under the banner of The National Botanic Gardens of Scotland which include Benmore in Dunoon, Dawyck in Stobo and the Royal Botanic in Edinburgh. These gardens carry out groundbreaking scientific research and conservation and are very well laid out and presented and all quite different in their appeal. Added to all this the myths, legends and folklore of this region are hugely interesting and each little area has its own stories of witches and tales of 'things that go bump in the night' but I'll leave you to seek out these amusements when you visit - you should - well worth it and because of the small area involved you can see much in a day, but perhaps stay over and see all over two days. Here in Strachur, well the big news is that Bumble - Charles Maclean's much loved Labrador - has delighted us with the arrival of four beautiful pups. These four 'thugs' are having a whale of a time as every visitor to Strachur House can't help but play with them so they're very well socialised. Alas, they will be going off soon to their new homes but we hope that Charlie will keep one so we can all spoil it rotten. I tried to get a photo of them but they just won't sit still - they prefer to hide under my skirts and eat my shoes - I'll keep trying. The garden is fabulous this year - well I think it's fabulous, serious gardeners would, I'm sure, shake their heads as plants are so abundant with the very warm April and lots of rain, they are all struggling to be seen. Lot's of pruning and digging up and re-planting required for the Autumn I'm afraid - ach well 'it keeps me from wearying' as my Aunty Jeanie would say.